Zenki Christian Dillo is Baker Roshi’s Dharma Heir and a Resident Teacher at Crestone Mountain Zen Center. Zenki began practicing Zen at the San Francisco Zen Center in 1996. He has been Baker Roshi’s student since 1997. From 2000-2003 he lived and practiced at Dharma Zentrum Quellenweg, Dharma Sangha’s Buddhist Study Center in the Black Forest, Germany. 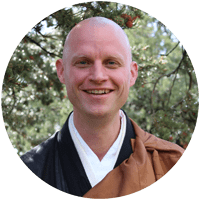 In 2003 he received monk and priest ordination from Baker Roshi and became a full-time resident at Crestone Mountain Zen Center. In 2013 he received dharma transmission from Baker Roshi.